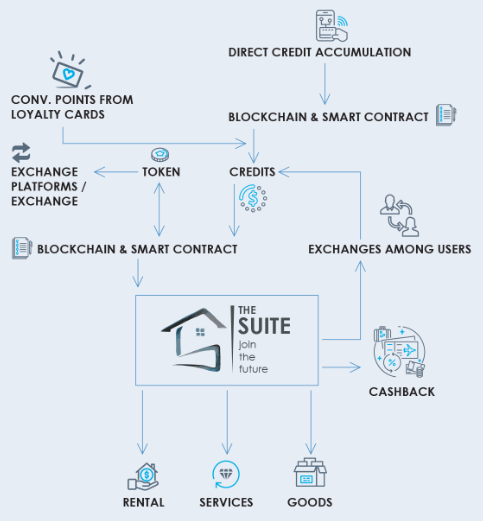 The Suite uses Blockchain Technology to decentralize the economy of Loyalty Cards. The Suite is a platform where users can accumulate loyalty points in a single account, simplifying the process and making obsolete the countless Loyalty Cards on the market. The combination of the STK token and SCT tokens will allow the blockchain-based hybrid system an application in the real market: SCT stability for the “loyalty point” and STK integrated into the system with specific services and events dedicated to investors and crypto users. The acquisition of infrastructures owned by The Suite the project will ensure a solid economic and business security and will immediately allow the use and distribution of SCT in the real-life market. It will be possible for anyone with a crypto-based project to integrate their services on the Suite platform. The spread of crypto will increase in daily use. users and the choice of specific services for already experienced users. FidelitySuite is a platform where you can accumulate loyalty points from participating stores and hypermarkets (without the need to have multiple cards) and convert them into services or cash through the SuiteCredit (SCT) and STK token. STK is the official crypto currency of Suite. Conversion of tokens will be possible into the exchanges and listing agreements are underway. In any case it will be possibile to convert tokens into decentralized exchanges.